A bustling, neon-soaked metropolis that floats effortlessly between the Old World and the future, Hong Kong is the most visited city on the planet – and for good reason. Visitors are usually drawn to two areas: the northern side of Hong Kong Island and Kowloon – the neighborhood attached to mainland China. The two areas are separated by Victoria Harbour, linked by the Star Ferry and the MTR. As a general rule, Hong Kong Island is the heart of Hong Kong's financial district and packed full of vast hotels and many of its best restaurants. Kowloon is more authentically Chinese, its streets narrower, its buildings less sleek and its prices generally lower. Make time to visit Wong Tai Sin, a temple dedicated to Great Immortal Wong and home to three leading Chinese religions: Buddhism, Taosim and Confucianism. It's instragrammable, no question, but Wong Tai Sin's enduring popularity may be explained by the temple's claim that it can “make every wish come true upon request." The area of Tsim Sha Tsui is home to many of Hong Kong's best museums, including the Museum of Art, the Space Museum, the Science Museum and the Museum of History, the latter managing to squeeze some 400 million years' worth of history into a 7,000 square meter space. The markets of Kowloon are unmissable in both senses, particularly the Ladies' Market on Tung Choi Street. With more than 100 stalls stretching out for a kilometer, head here and haggle for that new watch, bag or pretty much anything else you didn't know you needed. If you still have space in your luggage, the streets around Sham Shui Po are lined with a bewildering array of markets and traditional Chinese pawn shops. If you're around when night falls, the Temple Street Night Market is Hong Kong's liveliest, awash with stalls selling everything from trinkets to antiques. After exploring Kowloon, hop on the Star Ferry to get across Victoria Harbour to Hong Kong Island. If you time it right (around 8 p.m.), you'll be able to witness the Symphony of Lights up close, a nightly performance that includes lasers light up the skyscrapers on both sides of the harbor. Hong Kong's single-most essential experience involves taking the Peak Tram up Victoria Peak to get spectacular views looking down on Hong Kong Island and Kowloon Harbour. At 1,811 feet, it's the highest hill on the island. But the gravity-defying tram does most of the hard work for you, carrying you up towards the heavens and past some of the most expensive real estate on the planet. The Mid-Levels Escalator is a vast, interconnected system designed to ferry commuters up and down Hong Kong's steep hills. Wait for rush hour to pass, then hop on at the Central stop and off at any of the markets, bars or restaurants that catch your eye along the 25-minute route. Another temple worth visiting is the Man Mo Temple in Sheung Wan. Honoring the gods of literature ('Man') and of war ('Mo'), it's one of Hong Kong's oldest temples, dating back to 1847 and somewhat incongruous among the super-structures of the island's financial district. Pause for thought under its giant hanging incense coils as the world moves all around you. Take a short walk southeast of the temple, past the Zoological and Botanical Gardens, and you'll come to the "lungs of the city" in Hong Kong Park. An unexpected oasis of calm and tranquility, the park features museums, playgrounds and a "rainforest" aviary with more than 80 species of birds. Wherever you roam, from the food stalls of Mongkok and Jordan to the uber fine-dining of Central, eating well and finding food to suit all budgets and tastes in Hong Kong is no problem at all. For high-end, consider any of the city's seven three-starred Michelin restaurants (one in Kowloon, six on the island), the top pick of which is the permanently fully-booked Lung King Heen. For some of the world's cheapest Michelin-starred dim sum, grab a seat at Tim Ho Wan and expect the best dim sum you've ever tasted for less than $10. Elsewhere, The Chairman and Spring Deer are both notable – the former for its signature dish of pigeon with loonjing tea and chrysanthemum, the latter for its sublime roast Peking duck. As impressive as they are, however, don't leave Hong Kong without sampling at least a few local street stall delicacies. Curry fish balls, siumai dumplings and stinky tofu are entry-level staples; the deep-fried pig intestine is a more acquired taste. To be within walking distance of many of Hong Kong's main attractions, plus its best bars and restaurants, aim to stay around Central on the north shore of the island. October through December is Hong Kong's dry season, with more comfortable temperatures and favorable room rates, but it's also when pollution can be at its highest. For better visibility (and more impressive scenery), come in July or August but be prepared for high humidity and summer showers. Unless you like higher prices and longer lines, avoid the Chinese national holidays (“golden weeks") in January, February and October. Fly into Hong Kong International Airport (Chek Lap Kok) from multiple cities in the U.S. From there, you're a quick 25-minute drive to Hong Kong's city center. The quickest way is by taxi or by hopping onto the Airport Express trains that depart every 10 minutes and drop you off at Kowloon and Central stations. While much of Hong Kong's center is walkable, download the Mass Transit Railway app before you leave home. The MTR is the fastest way of getting around the city, its 90 stations covering all the areas you'll want to reach. Another good option is what the locals refer to as “the ding-ding" – Hong Kong's tram system that zig-zags throughout the city. 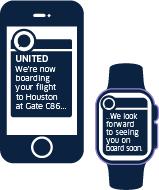 Visit united.com or download the convenient United app to book your flight.